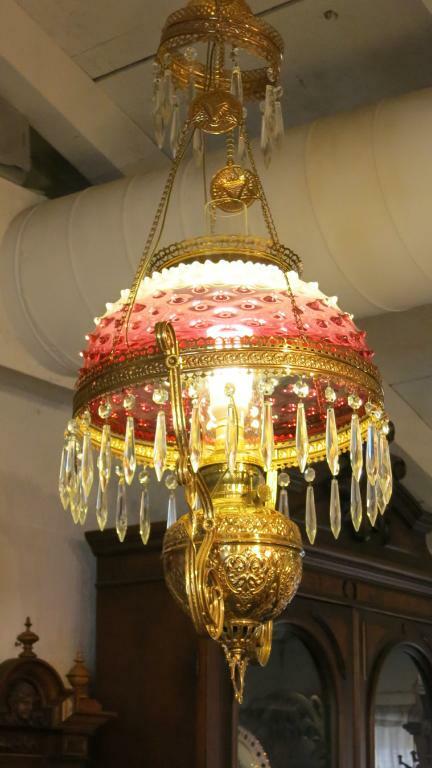 American Victorian Gone with the Wind Cranberry to White Hanging Fixture -- Exquisite original hanging Gone with the Wind light fixture with a hobnail cranberry to white shade. The shade measures 13 1/2" in diameter x 7" tall; the whole fixture measures 40" from top to bottom and 18" wide. It is in perfect original condition, and one of the nicest we've ever had. Exquisite original hanging Gone with the Wind light fixture with a hobnail cranberry to white shade. The shade measures 13 1/2" in diameter x 7" tall; the whole fixture measures 40" from top to bottom and 18" wide. It is in perfect original condition, and one of the nicest we've ever had.